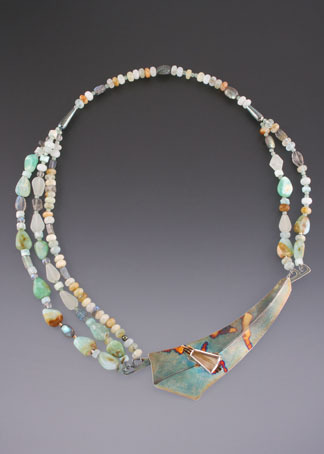 Necklace of patinated sterling silver, 14 Kt. gold and rutilated quartz with a variety of gemstone beads. A base of 14 Kt. gold bars accent and mimic the rutile needles in the clear quartz stone. Both are dramatically positioned across the ridgeline of the brooch. 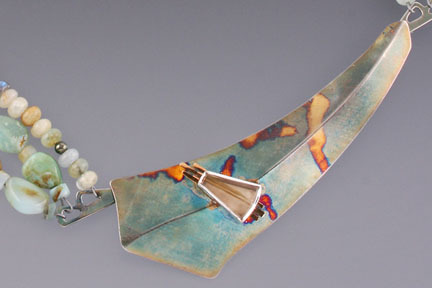 Patches of gold bonded to the silver surface of the brooch create contrast in the patina coloration.